Indian Motorcyle Retro Collage Sign. Don't hide your walls with artwork that doesn't mean anything, show off your Indian Motorcycle pride with one our many styles of Indian Motorcycle wood signs. Made especially for your order in the USA just like Indian Motorcycle. 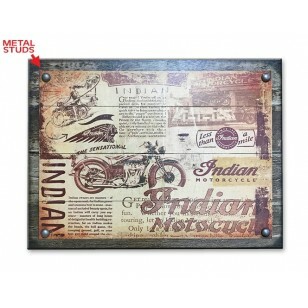 The perfect way to show support for Indian Motorcycle is with this Indian Motorcyle Retro Collage Sign. With its simple but vintage wood design, this is sure to be an eye-catching wood sign ideal for your office, garage, man cave, motorcycle club or any room in your house. This is a vintage style wood sign with a printed retro motorcycle collage. Embellished with 4 domed nickel-plated studs. Whether purchasing this sign as a gift or for yourself or for a fellow rider, you can take satisfaction knowing you're buying a quality wood sign that is proudly Made in the USA. Please note that website colors may not be precise representations of the actual product due to trans illumination. This is the colored light that shines out from your screen. Trans illuminated images deliver a much greater range of contrast and color intensity. Additionally, due to the variation in printing process, inks and substrates, each product will vary slightly.